Since the code was written during work hours, it was obviously a huge waste of company resources. To prevent similar occurrences in the future, we must minimize the waste of worked hours. And since it is common knowledge that a shorter program is faster to write, we must golf this code to be as short as possible! A single non-negative integer. You must not handle faulty input. Your program must produce output identical to that of the script above. You should output one word per line, and the number of words should be consistent with the original script. It is permissible to include non-newline whitespace characters at the end of each line (but not at the beginning) since they are invisible. One additional newline character is permissible at the very end of the output. Assumes input in cell A1, and that Wordwrap formatting is turned on for cell. Use Alt+Enter to add line feeds within the string and note the whitespace. 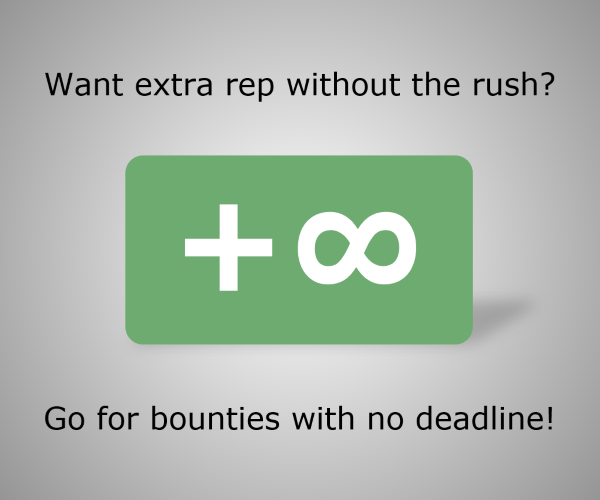 Only handles input up to 3570 due to limit of REPT function (Good luck getting a cell to be that tall, though). Each of these can be expressed with 9 characters, so a string is made of 54 characters (9 * 6), then repeated as large as Excel will allow. Then it takes the left 9 * (number of input) characters as the output. Linefeed for the "but and no" one is placed after the blank so that the Yeah for #6, #12, (etc) is formatted to the left rather than the right, and so that there is no blank linefeed added every 6th line for that item. We use a recursive function which goes from \$n\$ to \$1\$ rather than from \$0\$ to \$n-1\$. if \$n\equiv1\pmod 3\$, output "Yeah"
if \$n\equiv1\pmod 2\$, output "But"
if \$n\equiv2\pmod 3\$, output "No"
This allows us to store the simpler case \$n\equiv0\pmod 3\$ as the first entry of our lookup array, where we can define \$s\$: a variable holding either "But\n" or an empty string. The two other entries are defined as "Yeah\n" + s and s + "No\n" respectively. Note: By iterating from \$n-1\$ to \$0\$, we could define \$s\$ in the first entry just as well, but that would cost two extra parentheses. `But\n`     //       set s to "But"
s + `No\n`    //     3rd entry: s followed by "No"
Thanks to @JoKing for -11 bytes (reducing the amount of labels used from 8 to 7), and -24 more bytes (changing the general flow of the program and reducing the amount of labels used from 7 to 5 in the process). Whitespace is definitely not the right language for this challenge.. In Whitespace both loops and if-statements are made with labels and jumps to labels, and since they aren't if-elseif-else cases but multiple if-cases, it means I will have to jump back after every if, making it quite long it means I will have to slightly modify the checks to skip over some prints (thanks @JoKing). In general, it loops from the input down to 0, pushing a newline and the word reversed (so in the order "\noN", "\ntuB", "\nhaeY" instead of "Yeah\n", "But\n", "No\n"). And after the input has looped down to 0 and all the characters are on the stack, it will print those characters in reverse (so the correct output order). More in depth however: Although we need to print words in the range (input, 0], it will loop in the range [input, 0) instead. Because of this, we can use the check if(i%3 == 2) for "\noN" (or actually, if(i%3 != 2) skip the pushing of "\noN"), and we use the check if(i%2 != 1) for "\ntuB" (or actually, if(i%2 == 0) skip the pushing of "\ntuB"). Only after these two checks we decrease the iteration i by 1. And then do the check if(i%3 == 0) to push "\nhaeY", similar as in the JS example code in the challenge description. Skipping with if-not checks instead of going to a label and return from the label with if-checks saved 23 bytes. Also, in Whitespace character values are stored in the stack as their unicode values (i.e. 10 for new-lines, 65 for 'A', 97 for 'a', etc.). Since I already need to loop over the stack to print the characters, I am also able to use my Whitespace tip to lower the byte-count by adding a constant to the number values, before printing them as characters. has the values -94 for the newline, 7 for the 'o', and -26 for the 'N'. Because adding the constant of 104 will correctly give our unicode values 10, 111, and 78 for these characters respectively. 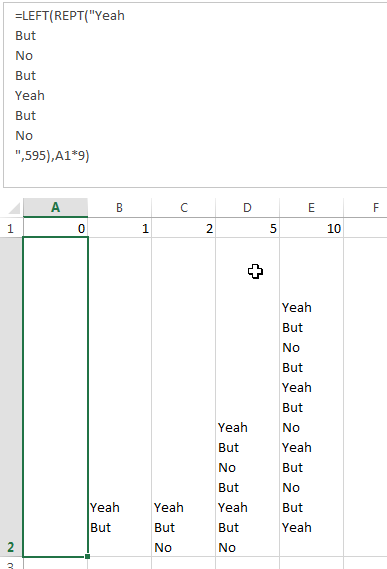 Port of Keeta's Excel answer. Saved 1 byte thanks to Kevin Cruijssen. Since initially submitting my answer, I've looked through some historic discussions here about what constitutes a suitable answer. Since it seems commonly accepted to provide just a method in Java (including return type and parameter declarations), here is a shorter, Groovy, method which has the method return value be the answer. Use of def means that the return type is inferred. Unlike the original answer below, which loops from 0 up to n-1, this one calls itself from n down to 1, but decrements the input for the rest of the line in the recursive call. Groovy scripts don't require certain common imports, so this can be a program printing the answer to Java's STDOUT without having to declare System.out. before print. It also provides some common utility methods, such as this toLong() which allows us to parse the input argument reasonably consicely. Essentially the Java 10 answer, but leveraging Groovy's shorter loop syntax and ability to evaluate truthy statements. Convert the input to unary. For each integer 0...n-1, generate three lines of text, one for each word, each with i 1s before it, except for No, which has two extra 1s so that we calculate (i+2)%3==0 which is equivalent to i%3==1. Remove pairs of 1s before Bs. Remove 1s in groups of three everywhere else. Delete all lines that still have a 1. -1 byte thanks to @OlivierGrégoire. Pretty simple, saved two bytes by using [1..n] instead of [0..n-1] and adjusted the remainders: The operator (?) tests takes four arguments, returning an empty list or the provided string as a singleton if the result is correct. (Note the space after But.) Takes input as a command-line argument. Try it online! and output the first a elements of it using cyclic indexing. As before, the final result is concatenated together and autoprinted. There's already a better C answer here but this one is recursive and it took me some time to get straight so I'm posting it. Very straight-forward answer, checking for a shorter, recursive method right now. This isn't exactly the best solution but it's my take on it. The hardest part was not to construct the list but to actually parse the decimal number. 2 bytes may be saved if the newline at the end is not required: c\ → d.
-2 bytes changing from i=0 to p-1 to i=1 to p and adjusting modulos. Apart from that, pretty straight-forward. Edit: -4 bytes from Keeta! Thanks!
' so if they are equal then there is no remainder! First note that we have a period of \$2\times3=6\$ due to the modulo definition. So the resulting list of lines should be these values repeated (or truncated) to length n concatenated together. “'⁴\ÆẓNƇ»      -   compressed string     "Yeah But No"